OK, I know this is probably impossible, but for beach lots I'd like something that links the beach activities available with the season that the beach is experiencing. See, I like to build beach communities. (Because, living in a landlocked state but as a person who spent much of her adult life with easy access to either the Atlantic or the Pacific, I miss the ocean.) However, they aren't all tropical beach communities. Most are temperate, actually, like, say, the Carolinas in the US. So, they have seasons. Even winter, in some cases. But of course the beaches on those lots have all the game's beach functions all the time, like swimming and sunbathing, which the Sims will do autonomously. As a person who lets her Sims free will a lot, I tend to have to watch their queues to make sure they don't try to go off sunbathing when it's snowing out. So, it'd be nice if the more "summery" activities were only available during the summer and maybe the late spring/early fall, but stuff like watching the waves or combing for shells or building sandcastles would always be available. I doubt it's possible to be that selective, but I can dream, right? Done. At least, I hope so. This is a global mod that overrides the guardian BHAVs for the Swim and sunbathe interactions so that the outside temperate must be at least 5 degrees Simsius (Simahrenheit?). 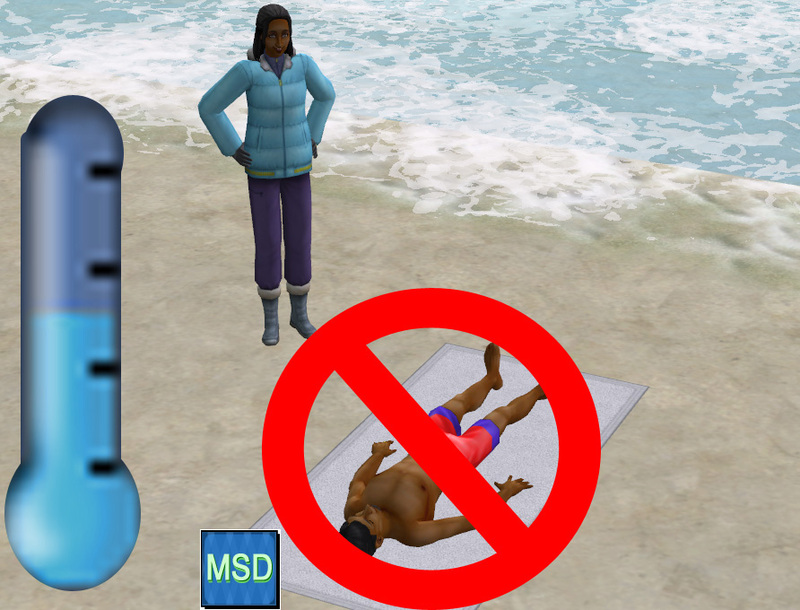 If the Sim's body temperature is "hot," they will still swim regardless of the outdoor temperature. Please let me know if there are any problems with this or if I should adjust the cut-off temperature. Since this conflicts with treeag's Sunbathe Anywhere, I have incorporated it with his permission (way back around 24th Jun 2012---yeah, I'm just now posting this) . So sunbathing should not be restricted to the beach. You should remove his mod (and any other mod that changes these BHAVs) before installing this. Just drop this in your Downloads folder. Remove it to uninstall it. iCad - for her support when I was having a bad time. Echo - "If I have seen further it is by standing on the shoulders of giants."